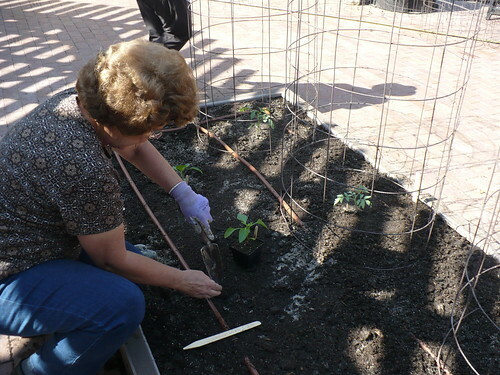 Yesterday was our big planting day in the Demo Garden. Our first planting day in the new garden! Most years we have 2 or 3 days when we do some major planting, but because of the renovation we ended up planting pretty much the entire garden at once. I will say that I am missing all of the colors and textures that the spring vegetables bring to a garden, although we really didn’t have any choice but to focus entirely on summer vegetables this year. The gals doing the Edible Flowers Garden were so on the ball that they had almost everything planted before I could take more pictures! Here’s the post with the plan for this garden. We have a whole bed planned for the cattle panel trellises again this year. Unfortunately, we planned the trellis garden for the landscape paver bed, which is slightly narrower planting space because of the width of the pavers. 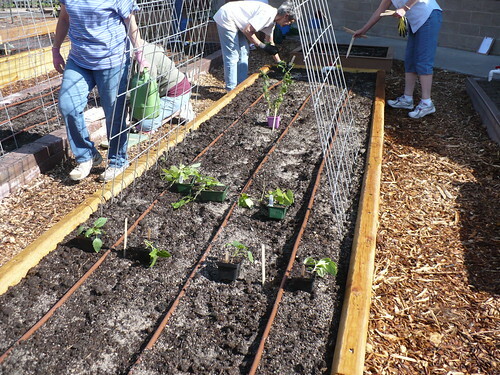 It makes the space under the trellises narrower and slightly harder to work with. I’m sure it will be fine, but it maybe shouldn’t have been the first choice! 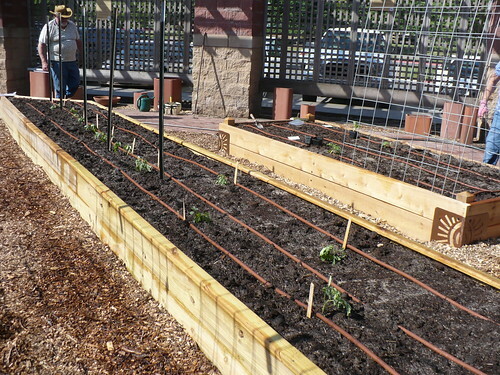 Everything in the bed was planted from seed – cucumbers, squash, and melons. 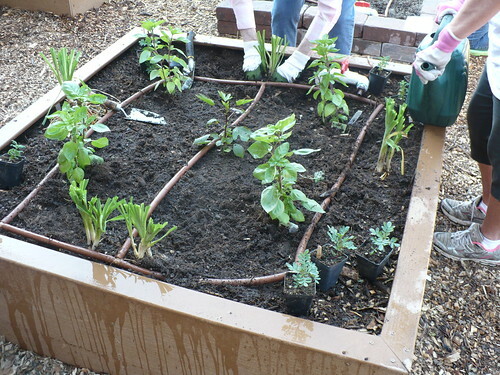 Here’s the garden plan if you want to see what we planted. Here’s a look at the Mexican Garden. We had jicama, Mexican oregano, tomatillos, peppers, and the Red Aztec Spinach ready to transplant. The jicama and some cantaloupe get to fight over the trellis! We also planted black beans and some zucchini. Here’s the map and original post about the plans. As is tradition, we have an entire raised bed devoted to tomatoes. 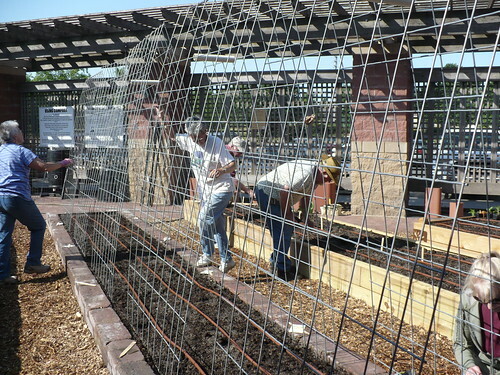 We are doing the Florida Weave method in half of it and tomato cages in the other half. Although I greatly prefer the Florida Weave method, I think that due to the width of our bed, it is probably not the most efficient use of space with our current layout. Here’s the post about the plans and the varieties we’re growing this year. This is our long plastic lumber bed with the two square second tiers. Half of the bed will be for the Prairie Star Annual Flower trials, and the other half is the Family of 4 Garden. As you can see, we have a pretty limited range of vegetables this year. Green beans, 2 zucchini, 2 cucumbers, 2 tomatoes, and 3 peppers. We should be able to get some fall things in after the beans and maybe after some of the other plants as well. 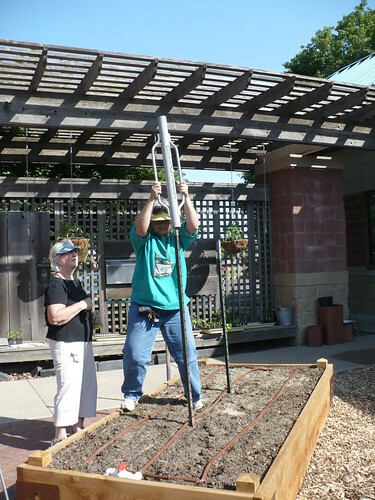 In the Beautiful Vegetables Garden, the first step was putting up some T posts to use for a bean trellis. We were going to use a wire trellis, but I think they are now planning to use a wire with twine hanging down for the beans. I’ll show more pictures when they get that project done. Meanwhile, here’s the original post with the plans. 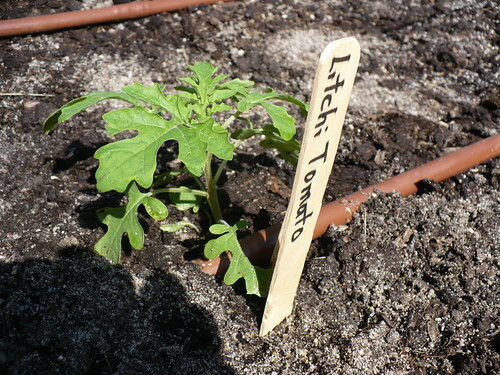 I didn’t get an overview picture of the New & Unique Vegetable Garden, but I did take a couple pictures of the Litchi Tomato. It is just starting to develop its prickles, so you can’t really see them yet. I can foresee taking lots of pictures of this cool plant this summer. Here’s the bed plan for the New & Unique Vegetable Garden. I think that’s it for this round of planting! We still have the 2 herb beds to plant as well as the Prairie Star Annuals (which arrived yesterday afternoon) and some of the containers. Posted on May 16, 2012, in Around the Garden, Family of 4 Garden, Working in the Garden and tagged Garden plan, garden planning, peppers, planting, spring garden, Tomatoes. Bookmark the permalink. Leave a comment.